The question has intrigued scientists for more than half a century. In 1950, Japanese Nobel Prize winner Sin-Itiro Tomonaga, followed by American physicist Joaquin Mazdak Luttinger in 1963, came up with a mathematical model showing that the effects of one particle on all others in a one-dimensional line would be much greater than in two- or three-dimensional spaces. Among quantum physicists, this model came to be known as the "Luttinger liquid" state. Until very recently, however, there had been only a few successful attempts to test the model in devices similar to those in computers, because of the engineering complexity involved. Now, scientists from McGill University and Sandia National Laboratories have succeeded in conducting a new experiment that supports the existence of the long-sought-after Luttinger liquid state. Their findings, published in the Jan. 23 issue of Science Express, validate important predictions of the Luttinger liquid model. The experiment was led by McGill PhD student Dominique Laroche under the supervision of Professor Guillaume Gervais of McGill's Department of Physics and Dr. Michael Lilly of Sandia National Laboratories in Albuquerque, N.M. 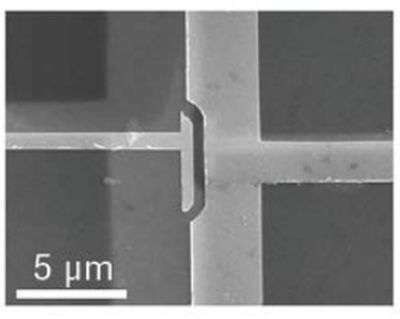 The new study follows on the team's discovery in 2011 of a way to engineer one of the world's smallest electronic circuits, formed by two wires separated by only about 15 nanometers, or roughly 150 atoms. What does one-dimensional quantum physics involve? Gervais explains it this way: "Imagine that you are driving on a highway and the traffic is not too dense. If a car stops in front of you, you can get around it by passing to the left or right. That's two-dimensional physics. But if you enter a tunnel with a single lane and a car stops, all the other cars behind it must slam on the brakes. That's the essence of the Luttinger liquid effect. The way electrons behave in the Luttinger state is entirely different because they all become coupled to one another." To scientists, "what is so fascinating and elegant about quantum physics in one dimension is that the solutions are mathematically exact," Gervais adds. "In most other cases, the solutions are only approximate." Making a device with the correct parameters to conduct the experiment was no simple task, however, despite the team's 2011 discovery of a way to do so. It took years of trial, and more than 250 faulty devices – each of which required 29 processing steps – before Laroche's painstaking efforts succeeded in producing functional devices yielding reliable data. "So many things could go wrong during the fabrication process that troubleshooting the failed devices felt like educated guesswork at times," explains Laroche. "Adding in the inherent failure rate compounded at each processing step made the fabrication of these devices extremely challenging." In particular, the experiment measures the effect that a very small electrical current in one of the wires has on a nearby wire. This can be viewed as the "friction" between the two circuits, and the experiment shows that this friction increases as the circuits are cooled to extremely low temperatures. This effect is a strong prediction of Luttinger liquid theory. The experiments were conducted both at McGill University and at the Center for Integrated Nanotechnologies, a U.S. Department of Energy, Office of Basic Energy Sciences user facility operated by Sandia National Laboratories. "It took a very long time to make these devices," said Lilly. "It's not impossible to do in other labs, but Sandia has crystal-growing capabilities, a microfabrication facility, and support for fundamental research from DOE's office of Basic Energy Sciences (BES), and we're very interested in understanding the fundamental ideas that drive the behavior of very small systems." The findings could lead to practical applications in electronics and other fields. While it's difficult at this stage to predict what those might be, "the same was true in the case of the laser when it was invented," Gervais notes. "Nanotechnologies are already helping us in medicine, electronics and engineering – and this work shows that they can help us get to the bottom of a long-standing question in quantum physics." More information: "1D-1D Coulomb Drag Signature of a Luttinger Liquid", D. Laroche, G. Gervais, M. P. Lilly, J. L. Reno, Jan. 23, 2014.Science Express. This article interests me in several ways because I don't possess the knowledge to question it properly. Perhaps I remember incorrectly but isn't a v of a wave expected to be higher than a fermi v as one of the signs of a 'luttinger liquid'? If so then how does the '...The way electrons behave in the Luttinger state is entirely different because they all become coupled to one another." come about? At face value it seems that the researchers did a lot of hard work to achieve thier results as well as admitting many failures, and is commendable. But that brings me to another question. Their sponsors (DOE, BES) are obviously very interested in solving this problem and the last paragraph hardly does service to the apparent importance. Can anyone enlighten me?